Betty’s Tunisian Tee front view, a photo by tygger428 on Flickr. 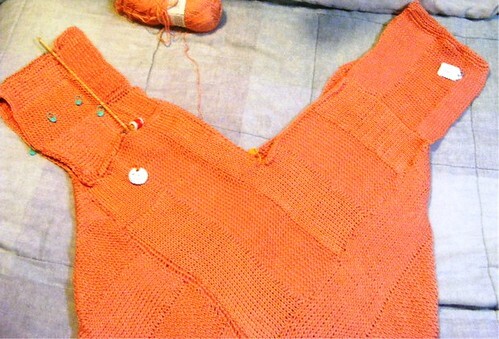 It has taken a LONG time to get this far, and the darned thing is more like a mini dress that a sweater. I prefer to consider it a “prototype”. That is a double ended bamboo crochet hook still in the right sleeve. Once that sleeve is finished, only the collar rows, and the edging rows around the sleeves to go. Hopefully washing it will help the sizing issue. We will see. This pattern is from the Fall 2011 issue of Interweave Crochet magazine, & is available for sale as a single pattern download on Interweave.com’s online store.